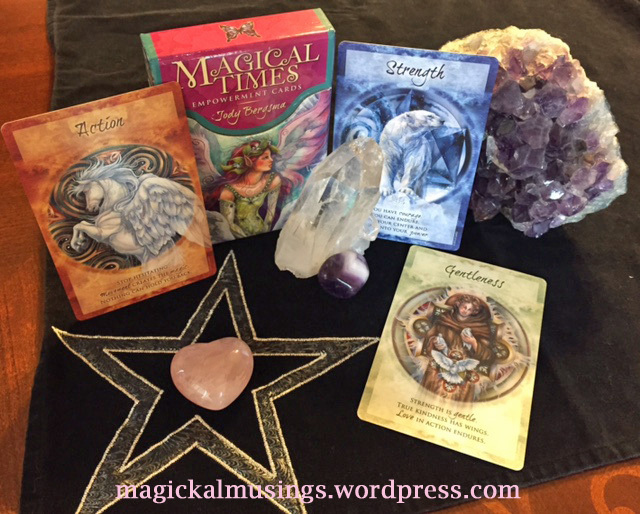 The Magical Times Empowerment Cards, Jody Bergsma. US Games, Inc. 2013. Artist Jody Bergsma’s Magical Times Empowerment Cards deliver just what the title suggests. The images are magical and the messages are empowering. Consisting of 44 cards housed in a flip-top box, the Magical Times Empowerment Cards is a lovely oracle with which to work. The LWB (Little White Book) that accompanies the deck is also housed within the box and consists of 27 pages. The cards and LWB both measure 3 1/2 x 5 1/4″. Interpretations are limited to 5-7 sentences that are phrased as positive affirmations that can be used together or in isolation if you so desire. The cards have background and borders of varying pastel colors with the image centered on the card within a circle. There is brief guidance provided at the base of each card with the title of the card centered at the top. The LWB includes three spreads. There is the single card spread for quick and general guidance. The 3-card Empowerment spread and a 5-card Elemental Influences spread. This is an excellent deck for beginners and those new to card reading. The images are very pretty and completely non-threatening. There isn’t any Devil or Death cards that might frighten first-time readers. The interpretations are very short with even shorter complementary guidance printed on each card, so the Magical Empowerment Cards lend themselves well to short, yet pithy readings. They’re great for quick guidance and little intuitive pick-me-ups. Fans of Jody Bergsma’s art will love this deck and readers who are looking for a lovely deck that gives short and concise readings will appreciate it as well. Previous Mercury Retrograde Dates for 2015.